The monsoons are here and the city roads have become pothole-ridden death traps. As it rains, in potholed Panjim, it’s all about bumpy rides and traffic jams. All thanks to the public works department (PWD), which has failed to own the responsibility of improving the condition of the deteriorating roads to ease the traffic. The pathetic condition of roads in the capital city has come to haunt residents and motorists in the area who rue how they are faced with a tough time commuting through this part of town. People have even took on social media to express their wrath with most critical points identified as St Inez, Tonca, DB Road, Caculo Island, Bhatlem, Mala and Market area. No doubt the road digging work post May 15 have stopped in the city following order from North Goa district magistrate under Section 144; but what about those half left works, which are also posing danger to human life. “The interior roads of the city are busy roads. Already these roads are very narrow and to add to that, the bad condition of the road has made our lives miserable. It is common phenomena that rainfall cause damage to the roads but that does not mean, authorities should not take up good quality work as per the required condition. You go on any part of the city and one witness only bumpy rides,” Manjunath Painginkar, resident of Tonca, said. “I think the police or judiciary should take cognizance of the matter and register offence against PWD for endangering human life. Some accountability has to be fixed,” Painginkar, a regular commuter, said as he fumed. Roshan Singh Sudh, a 75-year old retired Army officer said “there has to be a kind of discipline within the authorities, who wait for the monsoon to approach to take up repair or patch work. But with heavy rains that patch of tar disappears and what you see is a pothole. I don’t understand, why is that no one is held accountable for putting public life in danger? Crores of public money is spent on roads, still look at the condition of roads we get”. It is sorry state of affairs that most roads across the city are nothing to be proud about. So inferior is the quality of construction that often once it rains it’s hard to tell the difference between the road and a drain. Monsoons and the accompanying water-logging is an annual feature. Rather than preparing in advance by clearing drainage lines and repairing roads wherever required, authorities spring into action once the rains have wreaked havoc. It is this attitude what makes the neglect towards protecting the lives of citizens an unpardonable lapse. Regular motorists fear the situation might turn worse in case the city receives incessant rainfall. “Most of the time, motorists need to apply sudden brakes because roads here are either damaged or ridden with potholes. The condition of the road has also taken tall on our vehicle. The condition of the motorcycle has become worst,” Suyash Shirodkar, a office-goer from St Inez said. “We pay the road tax hence it becomes the duty of the government to provide quality roads to the public. Where is the money going? PWD Minister says Goa receives more than 100 inches of rains and that is the cause of the problem. Is it not very pathetic on part of Minister to blame rains for poor roads? Why is that government not improving on quality of roads?” questions Edwina Colaco, a college student, who travel all the way from Saligao. This must change, and change now. The suggestion in the Motor Vehicle (Amendment) Bill 2016 that contractors and civic agencies must be held accountable for bad roads and potholes is encouraging and needs to be implemented to the fullest. When contacted, PWD Principal Chief Engineer Uttam Parsekar, in a vague reply, said that department looks after maintenance of the roads, which are more than one year old. 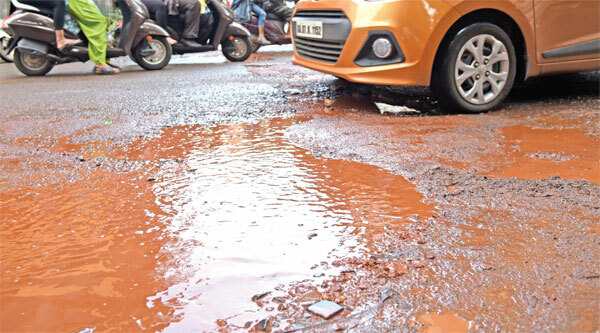 “Wherever we find potholes, we do repair by covering it with tar,” he said as he failed to justify as why the department fails to act prior monsoon and ensure smooth roads. The repair work, too, is an eye wash as it is basically a mixture of some concrete and the rubble thrown into the potholes and that's the end of it. It remains to be seen whether the bumpy potholed ride in Panjim can become a smooth one in reality ever.